Aussies love their sports – whether it’s as a spectator or a participant (usually both)!! Personally (and I’ve spoken about this until I’m blue in the face), I’m an absolute maniac about my footy (aussie rules and rugby league) and given that they are both winter sports down-under, I start to go very stir crazy once the season finishes in September every year. So this is where Singapore once again fills the void. I grew up on the Sunshine Coast in Queensland, so it was almost mandatory that I learned to surf at a very young age – as did most of my mates. So how’s this for absolutely brilliant???!!! Sentosa now has their very own Wavehouse!! 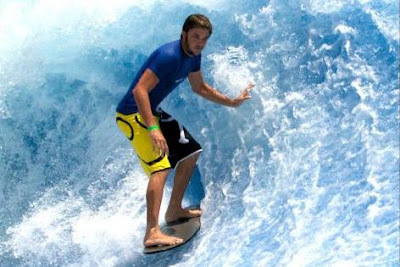 Now anyone can experience riding the ‘Flow Barrels’ without ever having to hit the ocean! Now this doesn’t mean of course that you can’t swim at the beach if that’s what you really desire. There are even a number of events all year round that you could compete in, if that’s what tickles your fancy. This is one of the good things about living near the equator – temperatures of anywhere between around 25 degrees Celsius to 33 degrees Celsius every single day. The tropical climate can make it very hot and humid sometimes to play football, so water sports are always a welcome diversion and a great way to “beat the heat”. In all, if you’re like me and have a fixation for outdoor activity and even body-punishing extreme or contact sports, then here’s another reason to make the move to Singapore… for work, study or play (or a combination of these). Check out more sports and recreation available in Singapore here.